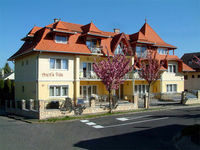 Well equipped modern apartments with a nice wellness area in the centre of Heviz, the most popular Spa resort in Hungary. The building is located in a nice green environment and it offers a familiar atmosphere for the guests. The high standard apartments have spacious living room, well equipped kitchen and an own balcony offering convenient accommodation. The guesthouse includes a cosy wellness oasis, with Jacuzzi, infra-sauna and tropic shower. Location: The new Anett's Villa is a modern building, with 8 apartments. 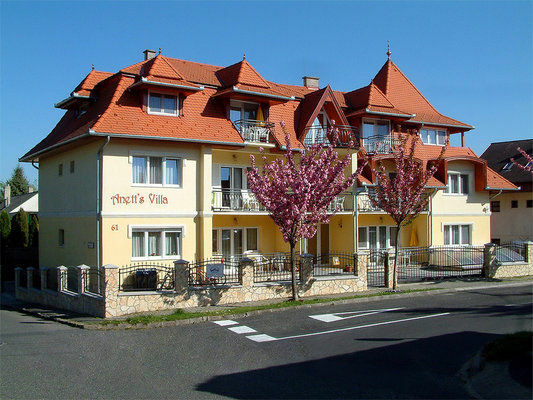 It is situated in one of Hévíz's most flowery and wonderful streets, in a peaceful, natural environment, yet not far from the lake and the town centre. The apartments are suitable for guests who like to spend their holiday in calm, peaceful surroundings of high standard, in a familiar atmosphere. Within 100 m you can find 2 nice restaurants and within 500 m a playground, hairdresser, and groceries. Guests can have massage in the house. You can park your car in the safe garden. In the grass-covered part of the garden guests will find a pergola, deck-beds and parasols. * Well-equipped kitchenette with fridge, electric hob, coffee maker, dishes, kitchen utensils etc. * Non-smoking rooms for an even better holiday! Wellness: The guesthouse includes a cosy wellness oasis, with Jacuzzi, infra-sauna and tropic shower, to provide you quality service. The guests can have massage in the house. In our apartments we offer quality and a calm atmosphere to our guests. Each room is decorated individually, reflects the individuality of its style and charm. - Non-smoking rooms for an even better holiday! • Rates exclude tourist tax (1.70 EUR per person per night).